It is dependent on a non-renewable resource: crude oil. When untreated foam (aka, “solid gasoline”) is ignited, it burns extremely fast. 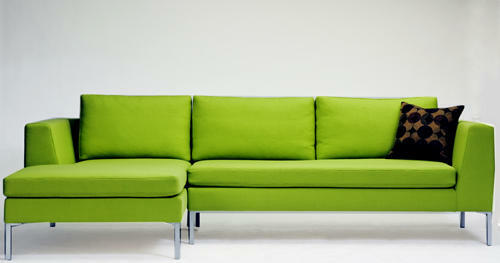 Ignited polyurethane foam sofas can reach temperatures over 1400 degrees Fahrenheit within minutes. Making it even more deadly is the toxic gas produced by burning polyurethane foam – hydrogen cyanide gas. Hydrogen cyanide itself is so toxic that it was used by the Aum Shinrikyo terrorists who attacked Tokyo’s subway system in 1995, and in Nazi death camps during World War II. The gas was also implicated in the 2003 Rhode Island nightclub fire that killed 100 people, including Great White guitarist Ty Longley, and injured more than 200 others. Tellingly, a witness to that fire, television news cameraman Brian Butler, told interviewers that “It had to be two minutes, tops, before the whole place was black smoke.” Just one breath of superheated toxic gas can incapacitate a person, preventing escape from a burning structure. Polyfoam is so flammable – burning so hot and emitting such toxic fumes while burning – that even the National Association of State Fire Marshals (NASFM) recommends that it be placed in Class 9 (an unusual but clearly hazardous material) because they are concerned about the safety of firemen and other first responders. According to the federal government’s National Institute of Standards and Technology, polyurethane foam in furniture is responsible for 30 percent of U.S. deaths from fires each year. Polyurethane foam was introduced as a cushion component in furniture in 1957 – only a bit more than 50 years ago – and quickly replaced latex, excelsior, cotton batting, horsehair and wool because it was CHEAP! Imagine – polyfoam cushions at $2 vs. natural latex at $7 or $8. Price made all the difference. But today – not long after jumping on the bandwagon – we have concerns about polyurethane: in addition to all the problems mentioned above there is concern about its carbon footprint. 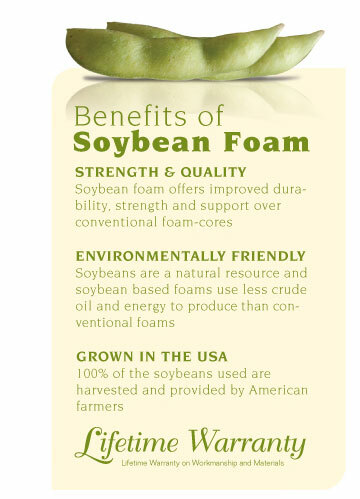 So now we see ads for a new miracle product: a bio based foam made from soybeans, which is highly touted as “A leap forward in foam technology, conserving increasingly scarce oil resources while substituting more sustainable options,” as one product brochure describes it. Companies and media releases claim that using soy in polyurethane foam production results in fewer greenhouse gas emissions, requires less energy, and could significantly reduce reliance on petroleum. Many companies are jumping on the bandwagon, advertising their green program of using foam cushions with “20% bio based foam” (everybody knows we have to start somewhere and that’s a start, right?). As Len Laycock, CEO of Upholstery Arts, says – who wouldn’t sleep sounder with such promising news? I have again leaned heavily on Mr. Laycock’s articles on poly and soy foam, “Killing You Softly”, for this post. As with so many over hyped ‘green’ claims, it’s the things they don’t say that matter most. While these claims contain grains of truth, they are a far cry from the whole truth. So-called ‘soy foam’ is hardly the dreamy green product that manufacturers and suppliers want people to believe. it reduces our dependence on fossil fuels by both reducing the amount of fossil fuel needed for the feedstock and by reducing the energy requirements needed to produce the foam. It’s made from soybeans, a renewable resource: This claim is undeniably true. But what they don’t tell you is that this product, marketed as soy or bio-based, contains very little soy. In fact, it is more accurate to call it ‘polyurethane based foam with a touch of soy added for marketing purposes’. For example, a product marketed as “20% soy based” may sound impressive, but what this typically means is that only 20 % of the polyol portion of the foam is derived from soy. Given that polyurethane foam is made by combining two main ingredients—a polyol and an isocyanate—in approximately equal parts, “20% soy based” translates to a mere 10% of the foam’s total volume. In this example the product remains 90% polyurethane foam and by any reasonable measure cannot legitimately be described as ‘based’ on soy. As Len Laycock asks, if you go to Starbucks and buy a 20 oz coffee and add 2-3 soy milk/creamers to it, does it become “soy-based” coffee? It reduces our dependence on fossil fuels: According to Cargill, a multi-national producer of agricultural and industrial products, including BiOH polyol (the “soy” portion of “soy foam”), the soy based portion of so called ‘soy foam’ ranges from 5% up to a theoretical 40% of polyurethane foam formulations (theoretical because 40% soy has not resulted in useable foams). This means that while suppliers may claim that ‘bio foams’ are based on renewable materials such as soy, in reality a whopping 90 to 95%, and sometimes more of the product consists of the same old petro-chemical based brew of toxic chemicals. This is no ‘leap forward in foam technology’ as claimed. It is true that the energy needed to produce soy-based foam is, according to Cargill, who manufactures the soy polyol, less that that needed to produce the polyurethane foam. But the way they report the difference is certainly difficult to decipher: soy based polyols use 23% less energy to produce than petroleum based polyols, according to Cargill’s LCA. But the formula for the foam uses only 20% soy based polyols, so by my crude calculations (20% of 50%…) the energy savings of 20% soy based foam would require only 4.6% less energy than that used to make the petroleum based foam. But hey, that’s still a savings and every little bit helps get us closer to a self sustaining economy and is friendlier to the planet. But the real problem with advertising soy based foam as a new, miracle green product is that the foam, whether soy based or not, remains a “greenhouse gas spewing pretroleum product and a witches brew of carcinogenic and neurotoxic chemicals”, according to Len Laycock. My concern with the use of soy is not its carbon footprint but rather the introduction of a whole new universe of concerns such as pesticide use, genetically modifed crops, appropriation of food stocks and deforestation. Most soy crops are now GMO: according to the USDA, over 91% of all soy crops in the US are now GMO; in 2007, 58.6% of all soybeans worldwide were GMO. If you don’t think that’s a big deal, please read our posts on these issues (9.23.09 and 9.29.09). The debate still rages today. Greenpeace did an expose (“Eating Up The Amazon”) on what they consider to be a driving force behind Amazon rainforest destruction – Cargill’s race to establish soy plantations in Brazil. You can read the Greenpeace report here, and Cargill’s rejoinder here. An interesting aside: There is an article featured on CNNMoney.com about the rise of what they call Soylandia – the enormous swath of soy producing lands in Brazil (almost unknown to Americans) which dominates the global soy trade. Sure opened my eyes to some associated soy issues. “Pretending to offer a ‘soy based’ foam allows these corporations to cloak themselves in a green blanket and masquerade as environmentally responsible corporations when in practice they are not. By highlighting small petroleum savings, they conveniently distract the public from the fact that this product’s manufacture and use continues to threaten human health and poses serious disposal problems. Aside from replacing a small portion of petroleum polyols, the production of polyurethane based foams with soy added continues to rely heavily on ‘the workhorse of the polyurethane foam industry’, cancer causing toluene diisocyanate (TDI). So it remains ‘business as usual ‘ for polyurethane manufacturers. Despite what polyurethane foam and furniture companies imply , soy foam is not biodegradable either. Buried in the footnotes on their website, Cargill quietly acknowledges that, “foams made with BiOH polyols are not more biodegradable than traditional petroleum-based cushioning”. Those ever so carefully phrased words are an admission that all polyurethane foams, with or without soy added, simply cannot biodegrade. And so they will languish in our garbage dumps, leach into our water, and find their way into the soft tissue of young children, contaminating and compromising life long after their intended use. The current marketing of polyurethane foam and furniture made with ‘soy foam’ is merely a page out the tobacco industry’s current ‘greenwashing’ play book. Like a subliminal message, the polyurethane foam and furniture industries are using the soothing words and images of the environmental movement to distract people from the known negative health and environmental impacts of polyurethane foam manufacture, use and disposal. Cigarettes that are organic (pesticide-free), completely biodegradable, and manufactured using renewable tobacco, still cause cancer and countless deaths. Polyurethane foam made with small amounts of soy derived materials still exposes human beings to toxic, carcinogenic materials, still relies on oil production, and still poisons life. The new change removes the allowance for the use of pre-industrial waste. The Version 2.1 will only recognize pre-consumer and post-consumer waste. This change was made because the Textile Exchange has determined that pre-industrial waste does not meet the Federal Trade Commission requirement for recycled input – which is that in order to be considered a recycled input, it must have been diverted from the waste stream. An example of such pre-industrial waste that does not meet the criteria for being diverted from the waste stream is that of short cotton fibers which fall out of cotton during the spinning process; the fibers are scooped up and re-introduced into the spinning process. In terms of polyester, an example would be that of a manufacturer collecting plastic pellets that have spilled onto the manufacturing floor, washing them and then feeding them directly back into the same manufacturing process without reprocessing. Both of these examples are considered an efficient manufacturing procedure and standard industry practice, not recycling. The new GRS standard becomes effective June 1, 2012. All companies being newly certified to the GRS will be required to use the new GRS v.2.1, while companies with existing GRS v2 certification will be able to maintain their current status until the end of the validity date of their certification. Textile Exchange is currently working on Version 3 of the GRS, and they say it will be more stringent than the current version, with further refining of definitions for inputs that can be claimed as recycled input and additional requirements for chemical inputs. Is it sustainable just because we’re told it is? I just tried to find out more about Project UDesign, a competition sponsored by the Savannah College of Art and Design (SCAD), Cargill, Toray Industries and Century Furniture. The goal is to produce a chair that is both “sustainable and sellable.” It is targeted to be the next “ eco friendly wing chair” on the market, with the goal of educating the industry and consumers on the topic of sustainable furniture design. Century Furniture has pledged to put the winning chair into production. Since criteria for the chair design is limited to the use of Cargill’s BiOH® polyols soy foam and Toray’s EcoDesign™ Ultrasuede® upholstery fabric we would like to help Project UDesign reach their goal of educating us on sustainable furniture design by explaining why we think these two products cannot be considered a sustainable choice . In fact, by sponsoring this competition and limiting the student’s choices to Cargill’s BiOH® polyols (“soy”) foams and Toray’s EcoDesign™ Ultrasuede® fabrics, it sends absolutely the wrong message to the students and the public about what constitutes an “eco friendly” choice. that it reduces our dependence on fossil fuels by both reducing the amount of fossil fuel needed for the feedstock and by reducing the energy requirements needed to produce the foam. It’s made from soybeans, a renewable resource: This claim is undeniably true. But what they don’t tell you is that this product, marketed as soy or bio-based, contains very little soy. In fact, it is more accurate to call it ‘polyurethane based foam with a touch of soy added for marketing purposes’. For example, a product marketed as “20% soy based” may sound impressive, but what this typically means is that soy accounts for only 10% of the foam’s total volume. Why? Given that polyurethane foam is made by combining two main ingredients—a polyol and an isocyanate—in 40/60 ratios (40% is the high end for BiOH® polyols used, it can be as low as 5%), “20% soy based” translates to 20% of the polyol portion, or 20% of the 40% of polyols used to make the foam. In this example the product remains 90% polyurethane foam ‘based’ on fossil fuels, 10% ‘based’ on soy. If you go to Starbucks and buy a 20 oz coffee and add 2-3 soy milk/creamers to it, does it become “soy-based” coffee? It is true that the energy needed to produce soy-based foam is, according to Cargill, who manufactures the soy polyol, less that that needed to produce the polyurethane foam. But because the soy based polyols represent only about 10% of the final foam product, the true energy reduction is only about 4.6% rather than 23%, which is what Cargill leads you to believe in their LCA, which can be read here. But hey, that’s still a savings and every little bit helps get us closer to a self sustaining economy and is friendlier to the planet, so this couldn’t be what is fueling my outrage. The real problem with advertising soy based foam as a new, miracle green product is that the foam, whether soy based or not, remains a ” greenhouse gas-spewing petroleum product and a witches brew of carcinogenic and neurotoxic chemicals”, according to Len Laycock of Upholstery Arts. My concern with the use of soy is not its carbon footprint but rather the introduction of a whole new universe of concerns such as pesticide use, genetically modifed crops (GMO), appropriation of food stocks and deforestation. Most soy crops are now GMO: according to the USDA, over 91% of all soy crops in the US are now GMO; in 2007, 58.6% of all soybeans worldwide were GMO. If you don’t think that’s a big deal, please read our posts on these issues (9.23.09 and 9.29.09). The debate still rages today. Greenpeace did an expose (“Eating Up The Amazon” ) on what they consider to be a driving force behind Amazon rain forest destruction – Cargill’s race to establish soy plantations in Brazil. You can read the Greenpeace report here, and Cargill’s rejoinder here. “Pretending to offer ‘soy based’ foam allows these corporations to cloak themselves in a green blanket and masquerade as environmentally responsible corporations when in practice they are not. By highlighting small petroleum savings, they conveniently distract the public from the fact that this product’s manufacture and use continues to threaten human health and poses serious disposal problems. Aside from replacing a small portion of petroleum polyols, the production of polyurethane based foams with soy added continues to rely heavily on ‘the workhorse of the polyurethane foam industry’, cancer-causing toluene diisocyanate (TDI). So it remains ‘business as usual’ for polyurethane manufacturers. Despite what polyurethane foam and furniture companies imply , soy foam is not biodegradable either. Buried in the footnotes on their website, Cargill quietly acknowledges that, “foams made with BiOH® polyols are not more biodegradable than traditional petroleum-based cushioning”. Those ever so carefully phrased words are an admission that all polyurethane foams, with or without soy added, simply cannot biodegrade. And so they will languish in our garbage dumps, leach into our water, and find their way into the soft tissue of young children, contaminating and compromising life long after their intended use. Cigarettes that are organic (pesticide-free), completely biodegradable, and manufactured using renewable tobacco, still cause cancer and countless deaths. Polyurethane foam made with small amounts of soy-derived materials still exposes human beings to toxic, carcinogenic materials, still relies on oil production, and still poisons life. If you’re still with us, lets turn our attention to Toray’s Ultrasuede, and their green claims. Toray’s green claim for Ultrasuede is that it is based on new and innovative recycling technology, using their postindustrial polyester scraps, which cuts both energy consumption and CO2 emissions by an average of 80% over the creation of virgin polyesters. If that is the only advance in terms of environmental stewardship, it falls far short of being considered an enlightened choice, as I’ll list below. Re: energy reduction: If we take Toray’s claim that it takes just 25 MJ of energy to produce 1 KG of Ultrasuede – that’s still far more energy than is needed to produce 1 KG of organic hemp or linen (10 MJ), or cotton (12 MJ) – with none of the benefits provided by organic agriculture. CO2 emissions are just one of the emissions issues – in addition to CO2, polyester production generates particulates, N2O, hydrocarbons, sulphur oxides and carbon monoxide, acetaldehyde and 1,4-dioxane (also potentially carcinogenic). Polyurethane, a component of Ultrasuede®, is the most toxic plastic known next to PVC; its manufacture creates numerous hazardous by-products, including phosgene (used as a lethal gas during WWII), isosyanates (known carcinogens), toluene (teratogenic and embryotoxic) and ozone depleting gases methylene chloride and CFC’s. Most polyester is produced using antimony as a catalyst. Antimony is a carcinogen, and toxic to the heart, lungs, liver and skin. Long term inhalation causes chronic bronchitis and emphysema. So, recycled – or not – the antimony is still present. Ethylene glycol (EG) is a raw material used in the production of polyester. In the United States alone, an estimated 1 billion lbs. of spent ethylene glycol is generated each year. The EG distillation process creates 40 million pounds of still bottom sludge. When incinerated, the sludge produces 800,000 lbs of fly ash containing antimony, arsenic and other metals. What does Toray do with its EG sludge? The major water-borne emissions from polyester production include dissolved solids, acids, iron and ammonia. Does Toray treat its water before release? Chemicals added to plastics are absorbed by human bodies. Some of these compounds have been found to alter hormones or have other potential human health effects. Synthetics do not decompose: in landfills they release heavy metals, including antimony, and other additives into soil and groundwater. If they are burned for energy, the chemicals are released into the air. We cannot condone the use of this synthetic, made from an inherently non-renewable resource, as a green choice for the many reasons given above. For millennia mankind depended on the natural world to supply its fiber needs. But scientists, as a result of extensive research, were able to replicate naturally occurring animal and plant fibers by creating fibers from synthetic chemicals. In the literature, it is often noted that there are three kinds of man-made fibers: those made by “transformation of natural polymers” (also called regenerated cellulosics), those made from synthetic polymers and those made from inorganic materials (These include the fibers made of glass, metal, ceramics and carbon.) But by far the largest group of man made synthetic fibers being produced today are made from synthetic polymers, so we’ll concentrate on those in this post. Man made fibers from synthetic polymers are created using polymerization of various chemical inputs to create polymers. Polymerization is the process of combining many small molecules into a large molecule – a polymer. Polymers are simply large molecules composed of repeating structural units. Polymers used for synthetic fibers are produced from intermediates (which in turn have been produced from crude oil) and applying a catalyst. Key intermediates are p-Xylene, teraphtalic acid, ethylene glycol and acrylonitrile; catalysts – manganese, cobalt and antimony oxide – are used to control the processes. Polymers are the building blocks of synthetic fibers – and of many other things. They are the basis of life and play an essential and ubiquitous role in our everyday life, ranging from familiar synthetic plastics to natural biopolymers such as DNA and proteins that are essential for life. Natural polymeric materials such as shellac, amber and natural rubber have been in use for centuries. Biopolymers, such as proteins and nucleic acids, play crucial roles in biological processes. A variety of other natural polymers exist, such as cellulose, which is the main constituent of cotton and wood. Synthetic polymers include vulcanized rubber, Bakelite and neoprene (and many more) in addition to polymers used in fibers: polyester, nylon, polystyrene, polyethylene, PVC, and polyacrylonitrile (known as acrylic). Synthetic fibers account for about half of all fiber usage, with applications in every field of fiber and textile technology. Four synthetic fibers – nylon, polyester, acrylic and polyolefin – dominate the market. These four account for approximately 98% by volume of global synthetic fiber production. But make no mistake, polyester is king: polyester alone accounted for around 80% of the global market share of man made fibers. Polyester has become the fiber of choice (sometimes blended with cotton) in garment production. As recently as 1990, world polyester production totaled 20 billion pounds. In 2002, production had more than doubled to 46 billion pounds – and was 61.5 billion pounds in 2009. Polyester fiber consumption increased at an annual growth rate of 6.2% between 1998 and 2008, although demand has recently moderated as a result of the global economic slowdown. 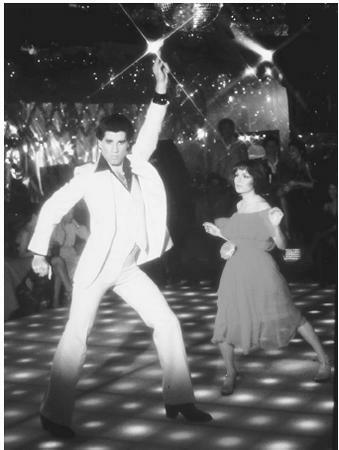 Since polyester is the king of synthetics (and because the data is available!) let’s look at how polyester is formed. First, the polymer is created; in the case of polyester, the polymer is made by heating either dimethyl teraphthalate (DMT) or terephthalic acid (TPA) with ethylene glycol in the presence of a catalyst (ususally antimony) at 536 º F for 30 minutes at atmospheric pressure and then for 10 hours under vacuum. The excess of ethylene glycol is distilled off. The resulting chemical, a monomer (single, non-repeating molecule) alcohol, is combined with terephthalic acid and raised to a temperature of 472°F (280°C). Newly-formed polyester, which is clear and molten, is extruded through a slot to form long ribbons. DRYING: After the polyester emerges from polymerization, the long molten ribbons are allowed to cool until they become brittle. The material is cut into tiny chips and completely dried to prevent irregularities in consistency. Melt spinning is the simplest of these three methods: In melt spinning, the polymer chips are melted at 500 – 518ºF to form a syrup-like solution. The solution is put in a metal container called a spinneret and forced through its tiny holes. The number of holes in the spinneret determines the size of the yarn, as the emerging fibers are brought together to form a single strand. Melt spinning is used with polymers such as nylon, polyethylene, polyvinyl chloride, cellulose triacetate, and polyethylene terephthalate, and in the multifilament extrusion of polypropylene. Dry spinning: the polymer is first dissolved in a solvent. The polymer solution is then extruded through the spinnerets. The solvent is evaporated with hot air and collected for reuse. The fiber then passes over rollers, and is stretched to orient the molecules and increase the fiber strength. Cellulose acetate, cellulose triacetate, acrylic, modacrylic, aromatic nylon, and polyvinyl chloride are made by dry spinning. In wet spinning, the polymer solution (i.e., polymer dissolved in a solvent as in dry spinning) is spun into a coagulating solution to precipitate the polymer. This process has been used with acrylic, modacrylic, aromatic nylon, and polyvinyl chloride fibers. For each pound of fiber produced with solvent spinning processes (dry or wet), a pound of polymer is dissolved in about 3 pounds of solvent. So the capture and recovery of these solvents is an integral part of the solvent spinning process. At present, most solvents are recovered, however emissions from the spinning operation are a significant consideration. But air pollution emissions from polyester fiber production also include polymer dust from drying operations, volatilized residual monomer, fiber lubricants (in the form of fume or oil smoke) and the burned polymer and combustion products from cleaning the spinning equipment. At the spinning stage, other chemicals may be added to the solution to achieve various effects such as making the material flame retardant, antistatic, or colorful (by adding dye chemicals). Because these fibers are created from crude oil, they’re highly flammable (in fact, they’re considered an accelerant) and pose a great threat for fire injury. The development of a durable flame retardant for synthetics was key in the safe consumer use of synthetic fibers. FILAMENT: When polyester emerges from the spinneret, it is soft and easily elongated up to five times its original length. To create filament, the fibers are stretched. The stretching forces the random polyester molecules to align in a parallel formation. This increases the strength, tenacity, and resilience of the fiber. This time, when the filaments dry, the fibers become solid and strong instead of brittle. Stretched, or drawn, fibers may vary greatly in diameter and length, depending on the characteristics desired of the finished material. Also, as the fibers are drawn, they may be textured or twisted to create softer or duller fabrics. After the polyester yarn is drawn, it is wound on large bobbins or flat-wound packages, ready to be woven into material. STAPLE: To create staple fiber, the spinneret has many more holes than when the production is filament fiber. The rope like bundles of polyester that emerge are called tow. Newly-formed tow is quickly cooled in cans that gather the thick fibers. Several lengths of tow are gathered and then drawn on heated rollers to three or four times their original length. CRIMPING: Drawn tow is then fed into compression boxes, which force the fibers to fold like an accordion, at a rate of 9-15 crimps per inch (3-6 per cm). This process helps the fiber hold together during the later manufacturing stages. SETTING: After the tow is crimped, it is heated at 212-302°F (100-150°C) to completely dry the fibers and set the crimp. Some of the crimp will unavoidably be pulled out of the fibers during the following processes. CUTTING: Following heat setting, tow is cut into shorter lengths. Polyester that will be blended with cotton is cut in 1.25-1.50 inch (3.2-3.8 cm) pieces; for rayon blends, 2 inch (5 cm) lengths are cut. For heavier fabrics, such as carpet, polyester filaments are cut into 6 inch (15 cm) lengths. By and large, synthetic fibers are used for their utility in specific markets. Polyester is difficult and expensive to dye, but has attributes that make it ideal for blending with cotton and other natural fibers. Easy care of the permanent press fabric made polyester doubleknits extremely popular in the late 1960s. However, polyester has suffered an “image problem” since that time, and clothes made out of polyester were often devalued and even ridiculed. Polyester has the advantage of being very cheap to produce, but it is a much less attractive fiber to live with when compared to the inherent breathability, moisture absorption capabilities and heat moderation inherent in natural fibers. Polyesters have the advantage in wash-and-wear properties, wrinkle resistance – and in durability. Manufacturers tried to make polyester easier to use in garments by blending polyester with cotton, wool or other natural fibers. Several new forms of polyester introduced in the early 1990s may help revitalize the image of polyester. A new form of polyester fiber, called microfiber, was introduced to the public in 1991. Microfibers have diameters that are less than typical fibers; they are about half the diameter of fine silk fiber, one-quarter the diameter of fine wool, and one hundred times finer than human hair. Microfibers allow a fabric to be woven that is lightweight and strong. They can be tightly woven so that wind, rain, and cold do not easily penetrate. Rainwear manufactures use microfibers for this reason. They also have the ability to allow perspiration to pass through them. In addition, microfibers are very flexible because their small fibers can easily slide back and forth on one another. The first fabric made from microfiber was Ultrasuade, in which short polyester microfibers were imbedded into a polyurethane base. Today, microfibers are manufactured primarily from polyesters, nylon, and acrylic fibers. They are used under various trade names to make a variety of products, such as clothing, hosiery, bedding, and scarves. Textile researchers at North Carolina State University are developing a form of polyester that may be as strong as Kevlar, a superfiber material used to make bulletproof vests. Nylon, the granddaddy of man-made fibers, seems to be losing share to polyester, overwhelmed by sheer volume if not performance. In carpets, staple nylon gradually is being replaced by filament; tires increasingly use polyester over nylon; and many woven industrial and apparel fabrics seem to favor polyester. Nylon’s dyeability is an advantage, but not sufficiently so to overcome the supply and variants available in polyester. Acrylic gradually is losing the price battle with polyester and increasingly is relegated to bulk and wool-substitute end-uses. Donate online at www.clintonfoundation.org/haitirelief to help provide immediate relief and long-term support to earthquake survivors. Text “HAITI” to 20222 and $10 will be donated to relief efforts, charged to your cell phone bill. The most popular type of cushion filler today is polyurethane foam. Also known as “Polyfoam”, it has been the standard fill in most furniture since its wide scale introduction in the 1960’s because of its low cost (really cheap!). A staggering 2.1 billion pounds of flexible polyurethane foam is produced every year in the US alone. A polyol is a substance created through a chemical reaction using methyloxirane (also called propylene oxide). Toluene diisocyanate (TDI) is the most common isocyanate employed in polyurethane manufacturing, and is considered the ‘workhorse’ of flexible foam production. Both are on the List of Toxic Substances under the Canadian Environmental Protection Act. Propylene oxide and TDI are also among 216 chemicals that have been proven to cause mammary tumors. However, none of these chemicals have ever been regulated for their potential to induce breast cancer. The US Environmental Protection Agency (EPA) considers polyurethane foam fabrication facilities potential major sources of several hazardous air pollutants including methylene chloride, toluene diisocyanate (TDI), and hydrogen cyanide. There have been many cases of occupational exposure in factories (resulting in isocyanate-induced asthma, respiratory disease and death), but exposure isn’t limited to factories: The State of North Carolina forced the closure of a polyurethane manufacturing plant after local residents tested positive for TDI exposure and isocyanate exposure has been found at such places as public schools. Polyurethane foams are advertised as being recyclable, and most manufacturing scraps (i.e., post industrial) are virtually all recycled – yet the products from this waste have limited applications (such as carpet backing). Post consumer, the product is difficult to recycle, and the sheer volume of scrap foam that is generated (mainly due to old cushions) is greater than the rate at which it can be recycled – so it mostly ends up at the landfill. This recycling claim only perpetuates the continued use of hazardous and carcinogenic chemicals. Polyfoam has some hidden costs (other than the chemical “witch’s brew” described above): besides its relatively innocuous tendency to break down rapidly, resulting in lumpy cushions, and its poor porosity (giving it a tendency to trap moisture which results in mold), it is also extremely flammable, and therein lies another rub! Polyurethane foam is so flammable that it’s often referred to by fire marshals as “solid gasoline.” Therefore, flame-retardant chemicals are added to its production when it is used in mattresses and upholstered furniture. This application of chemicals does not alleviate all concerns associated with its flammability, since polyurethane foam can release a number of toxic substances at different temperature stages. For example, at temperatures of about 800 degrees, polyurethane foam begins to rapidly decompose, releasing gases and compounds such as hydrogen cyanide, carbon monoxide, acetronitrile, acrylonitrile, pyridine, ethylene, ethane, propane, butadine, propinitrile, acetaldehyde, methylacrylonitrile, benzene, pyrrole, toluene, methyl pyridine, methyl cyanobenzene, naphthalene, quinoline, indene, and carbon dioxide. Of these chemicals, carbon monoxide and hydrogen cyanide are considered lethal. When breathed in, it deprives the body of oxygen, resulting in dizziness, headaches, weakness of the limbs, tightness in the chest, mental dullness, and finally a lapse of concsiousness that leads to death. Many of these are considered potential carcinogens or have been associated with a number of adverse health effects. In conclusion, the benefits of polyfoam (low cost) is far outweighted by the disadvantages: being made from a non-renewable resource (oil), and the toxicity of main chemical components as well as the toxicity of the flame retardants added to the foam. Natural or Synthetic latex: The word “latex” can be confusing for consumers, because it has been used to describe both natural and synthetic products interchangeably, without adequate explanation. This product can be 100% natural (natural latex) or 100% man-made (derived from petrochemicals) – or it can be a combination of the two – the so called “natural latex”. Also, remember latex is rubber and rubber is latex. Natural latex – The raw material for natural latex comes from a renewable resource – it is obtained from the sap of the Hevea Brasiliensis (rubber) tree, and was once widely used for cushioning. Rubber trees are cultivated, mainly in South East Asia, through a new planting and replanting program by large scale plantation and small farmers to ensure a continuous sustainable supply of natural latex. Natural latex is both recyclable and biodegradeable, and is mold, mildew and dust mite resistant. It is not highly flammable and does not require fire retardant chemicals to pass the Cal 117 test. It has little or no off-gassing associated with it. Because natural rubber has high energy production costs (although a smaller footprint than either polyurethane or soy-based foams), and is restricted to a limited supply, it is more costly than petroleum based foam. Synthetic latex – The terminology is very confusing, because synthetic latex is often referred to simply as “latex” or even “100% natural latex”. It is also known as styrene-butadiene rubber (SBR). The chemical styrene is toxic to the lungs, liver, and brain. Synthetic additives are added to achieve stabilization. Often however, synthetic latex can be made of combinations of polyurethane and natural latex, or a combination of 70% natural latex and 30% SBR. Most stores sell one of these versions under the term “natural latex” – so caveat emptor! Being petroleum based, the source of supply for the production of synthetic latex is certainly non-sustainable and diminishing as well. Next I would like to talk about those new soy based foams that are all the rage, but I don’t want to bite off too much. Plus I’m a bit overwhelmed by the data. It’s a big topic and one that deserves its own post. So that’s going to be next week’s post! Why is recycled polyester considered a sustainable textile? Synthetic fibers are the most popular fibers in the world – it’s estimated that synthetics account for about 65% of world production versus 35% for natural fibers. Most synthetic fibers (approximately 70%) are made from polyester, and the polyester most often used in textiles is polyethylene terephthalate (PET). Used in a fabric, it’s most often referred to as “polyester” or “poly”. The majority of the world’s PET production – about 60% – is used to make fibers for textiles; about 30% is used to make bottles. It’s estimated that it takes about 104 million barrels of oil for PET production each year – that’s 70 million barrels just to produce the virgin polyester used in fabrics. That means most polyester – 70 million barrels worth – is manufactured specifically to be made into fibers, NOT bottles, as many people think. Of the 30% of PET which is used to make bottles, only a tiny fraction is recycled into fibers. But the idea of using recycled bottles – “diverting waste from landfills” – and turning it into fibers has caught the public’s imagination. energy needed to make the rPET is less than what was needed to make the virgin polyester in the first place, so we save energy. And we’re keeping bottles and other plastics out of the landfills. Let’s look at these arguments. Despite the savings of both energy and emissions from the recycling of PET, the fact is that it is still more energy intensive to recycle PET into a fiber than to use organically produced natural fibers – sometimes quite a bit more energy. 2) We’re diverting bottles and other plastics from the landfills. That’s undeniably true, because if you use bottles then they are diverted! But the game gets a bit more complicated here because rPET is divided into “post consumer” PET and “post industrial” rPET: post consumer means it comes from bottles; post industrial might be the unused packaging in a manufacturing plant, or other byproducts of manufacturing. The “greenest” option has been touted to be the post consumer PET, and that has driven up demand for used bottles. Indeed, the demand for used bottles, from which recycled polyester fibre is made, is now outstripping supply in some areas and certain cynical suppliers are now buying NEW, unused bottles directly from bottle producing companies to make polyester textile fiber that can be called recycled. Using true post consumer waste means the bottles have to be cleaned (labels must be removed because labels often contain PVC) and sorted. That’s almost always done in a low labor rate country since only human labor can be used. Add to that the fact that the rate of bottle recycling is rather low – in the United States less than 6% of all waste plastic gets recycled . The low recycling rate doesn’t mean we shouldn’t continue to try, but in the United States where it’s relatively easy to recycle a bottle and the population is relatively well educated in the intricacies of the various resin codes, doesn’t it make you wonder how successful we might be with recycling efforts in other parts of the world? Mechanical recycling is accomplished by melting the plastic and re-extruding it to make yarns. However, this can only be done few times before the molecular structure breaks down and makes the yarn suitable only for the landfill where it may never biodegrade, may biodegrade very slowly, or may add harmful materials to the environment as it breaks down (such as antimony). William McDonough calls this “downcycling”. Chemical recycling means breaking the polymer into its molecular parts and reforming the molecule into a yarn of equal strength and beauty as the original. The technology to separate out the different chemical building blocks (called depolymerization) so they can be reassembled (repolymerization) is very costly and almost nonexistent. Most recycling is done mechanically (or as noted above, by actual people). Chemical recycling does create a new plastic which is of the same quality as the original, but the process is very expensive and is almost never done, although Teijin has a new program which recycles PET fibers into new PET fibers. which are appropriate to make into toys, carpet, filler for pillows, CD cases, plastic lumber products, fibers or a million other products. But not new soda or milk bottles. These second generation plastics can then be recycled a second time into park benches, carpet, speed bumps or other products with very low value. or where it will hold space for many years or maybe become part of the Great Pacific Garbage Patch! And there is another consideration in recycling PET: antimony, which is present in 80 – 85% of all virgin PET, is converted to antimony trioxide at high temperatures – such as are necessary during recycling, releasing this carcinogen from the polymer and making it available for intake into living systems. Many rPET fibers are used in forgiving constructions such as polar fleece, where the construction of the fabric hides slight yarn variations. For fabrics such as satins, there are concerns over streaks and stripes. or they are blends of different synthetics (polyester and nylon, for example). Either of these renders the fabric unsuitable for the mechanical method of recycling, which cannot separate out the various chemicals in order to produce the recycled yarn; the chemical method could – if we had the money and factories to do it. One of the biggest obstacles to achieving McDonough’s Cradle-to-Cradle vision lies outside the designers’ ordinary scope of interest – in the recycling system itself. Although bottles, tins and newspapers are now routinely recycled, furniture and carpets still usually end up in landfill or incinerators, even if they have been designed to be recycled  because project managers don’t take the time to separate out the various components of a demolition job, nor is collection of these components an easy thing to access. Currently, the vision that most marketers has led us to believe, that of a closed loop, or cycle, in which the yarns never lose their value and recycle indefinitely is simply that – just a vision. Few manufacturers, such as Designtex (with their line of EL fabrics designed to be used without backings) and Victor Innovatex (who has pioneered EcoIntelligent™ polyester made without antimony), have taken the time, effort and money needed to accelerate the adoption of sustainable practices in the industry so we can one day have synthetic fabrics that are not only recycled, but recyclable. William McDonough and Michael Braungart, “Transforming the Textile Industry”, green@work, May/June 2002.